One of my favorite girlhood pastimes was playing a board game called “Barbie, Queen of the Prom.” The object was to get to the prom first, with the prettiest dress and the handsomest date. We would roll the dice to win one of four boyfriends, the most desirable of whom was Ken, a perfect, chiseled WASP of a fellow, on whose arm we would presumably spark the envy of all the other girls. Honestly, readers, this game and its questionable values messed me up for years. 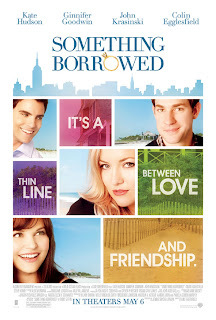 I was reminded of this while watching SOMETHING BORROWED, a romantic comedy in which two women compete for the love of a man named Dex, played by the impossibly good-looking Colin Egglesfield, late of Melrose Place and All My Children. Aside from being a nice guy who will lend a law school classmate his only pen, Dex’s chief virtue is his underwear-model handsomeness. He is also maddeningly feckless, an object tossed about by two women and his parents, a helpless cork bobbing about in a sea of other people’s desires. 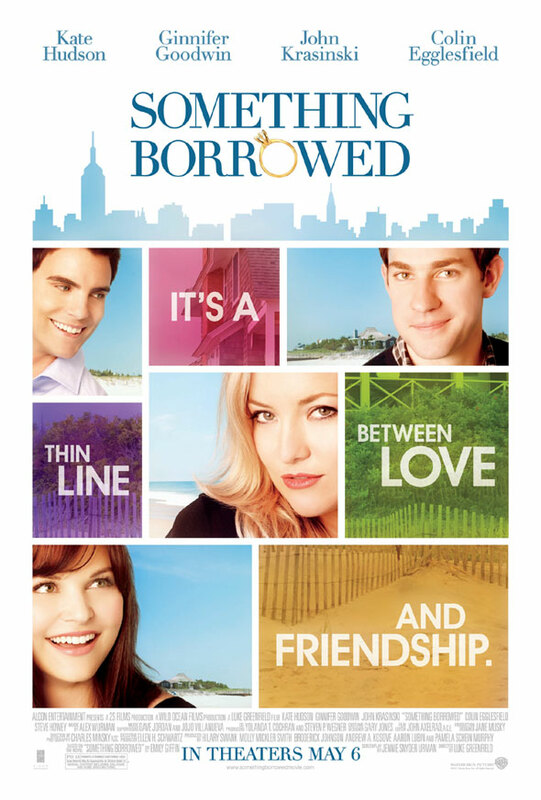 The movie is directed by Luke Greenfield, based on a best-selling novel by Emily Giffin, one of those lightweight, pink-covered books popularly classified as “chick lit.” It is clearly aimed at women who came of age in the ’80s, sprinkled as it is with references to such cultural talismans as Who’s The Boss and Growing Pains. The novel is narrated by Rachel, an associate at a New York law firm associate who is turning 30 and still single (gasp!). After her surprise birthday party, Rachel winds up drunkenly sleeping with her best friend’s fiancé, the aforementioned Dex, on whom she has harbored a secret crush since they were law school classmates. Like a girl playing the Barbie game, Rachel never believed she could win anyone as handsome as Dex, so she fixed him up with her prettier, flirtier best friend, Darcy. (In the Barbie game, Rachel would have drawn the freckle-faced nerd called Poindexter.) As it happens, Dex has been in love with Rachel for years. These details would matter less if the movie were funnier, but Jennie Snyder’s wit-challenged screenplay leaves the cast, which also includes John Krasinski as Ethan, Rachel’s confidante and Steve Howey as Marcus, a goofy womanizer, reciting lines that are supposed to be amusing but aren’t. It doesn’t help that the leading characters are so lacking in charisma. Goodwin, something of a specialist in lovelorn single-girl roles (He’s Just Not That Into You), is mannered and annoying, and Hudson’s Darcy is a shallow, self-centered vulgarian, making it hard to fathom why Rachel loves her so much and why Dex ever wanted to marry her — let alone why his uptight upper-class parents are so crazy about her. The romantic triangle, which troubles the waters during an entire summer of weekends in the Hamptons, is resolved in a way that is all too convenient, so no one needs to bother about the moral implications. The success of a romantic comedy depends largely on good writing and likable characters whose fate the audience cares about. This entry falls short in both areas, and its flaccid pacing makes it seem even longer than its 110-minute running time. Yet it is not without its virtues — pretty people, attractive New York settings, glowing cinematography by Charles Minsky, and a pop soundtrack designed to appeal to women whose tastes were formed in the ’80s and '90s. Many of these women have read Giffin’s book, and will drag their reluctant boyfriends to the movie. Fair warning to those young gentlemen: a short post-credits scene threatens a sequel, probably based on Giffin’s Something Blue. 2 1/2 out of 4 stars.